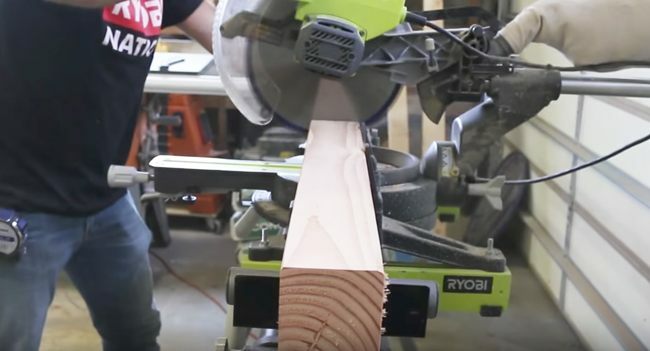 Orbital Sander​– Ryobi makes a nice one. The first step in this project is to cut base piece and side strips. This step will use up about half of the 4×8 sheet. Next we will need to assemble the form. 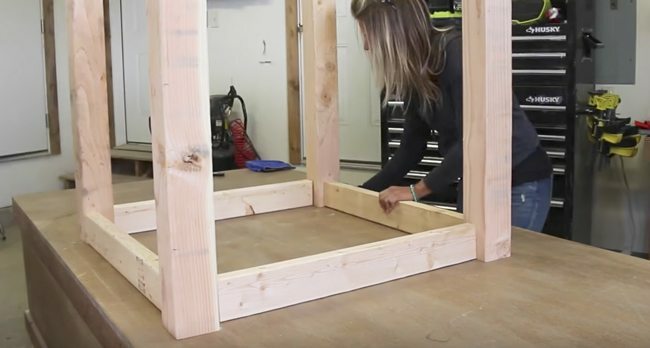 Use screws every 6″ to 8″ to get a tight fit between the walls and the base of the frame. Be sure that the walls are all square to each other and to the base as this will form the shape of the table. Next you will need to use masking tape next to all the seams leaving 1/8″ to 1/4″ of space next to the seam. Then use a caulk gun to lay silicon on the seams. Dip your finger in water and go back over the silicon, making sure it covers the seam and is smooth. Cut out the acrylic coasters so that to prepare them for the mold. Lightly sand the coasters so they diffuse the light from the LEDs. Use a square and tape measure to lay the coasters evenly. Next, trace around them with a pencil. Do the same thing for the bucket that will be in the center of the tabletop. Center the bucket and then trace its outline. 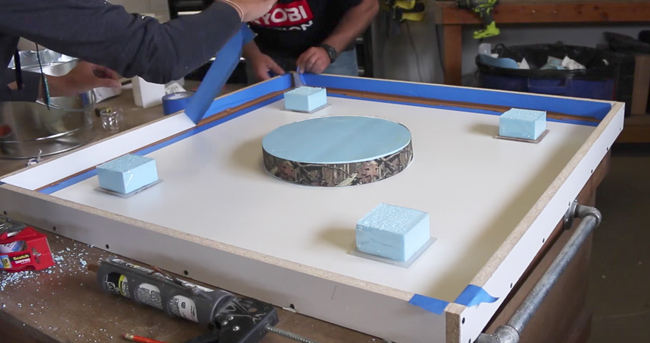 Next, create the foam knockouts that will create spaces for the bucket and coasters through the tabletop. Use a jigsaw to cut out a foam circle the size of the bucket top and then use a belt sander to clean up the foam. 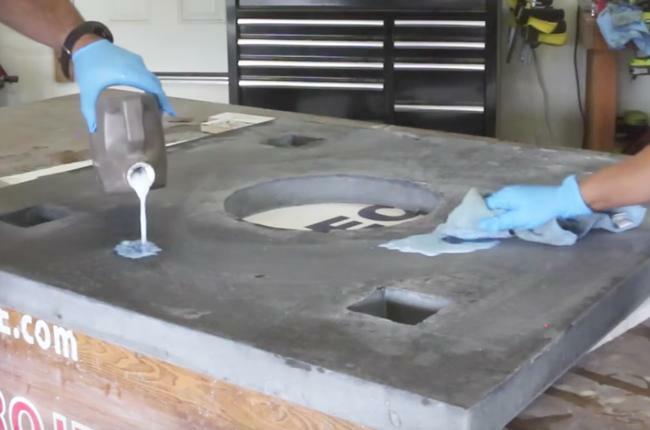 Once the foam is cleaned up and smooth you will need to use tape (packing tape or duct tape) around the outside of the of the foam cylinder so the surface is perfectly smooth against the concrete. 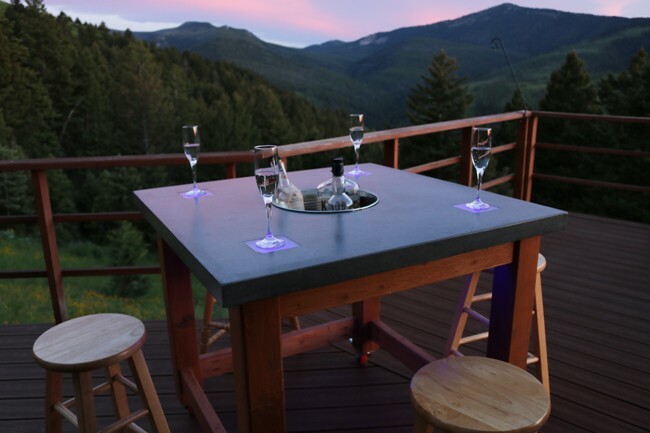 Use the same process to create rectangles that will be attached to the coasters so there is a space all the way through the concrete for the LED lights to shine through. 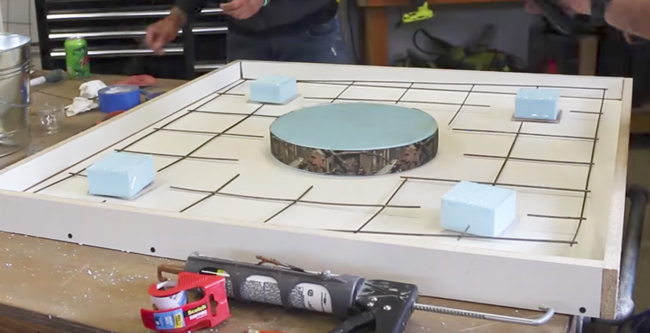 Use the silicon to glue all the coasters and foam inserts to their marked spots in the form. Now with all of our inserts in place we will need to take the steel reinforcement mesh and cut it to fit the melamine form. Use a bolt cutter to cut it down to size and then cut out sections for the foam inserts to fit through. Wear gloves and a good mask or a respirator so you don't breathe in the concrete dust. Mix the concrete (1 or 2 bags at a time) and get it to an oatmeal like consistency. Pour the concrete into the form using a bucket so it fills the form a little more than half way. Tap the sides of the form with a hammer to get and air bubbles out as best as possible. Lay the steel reinforcement we cut earlier into the concrete so it is flat and just covered in the concrete. 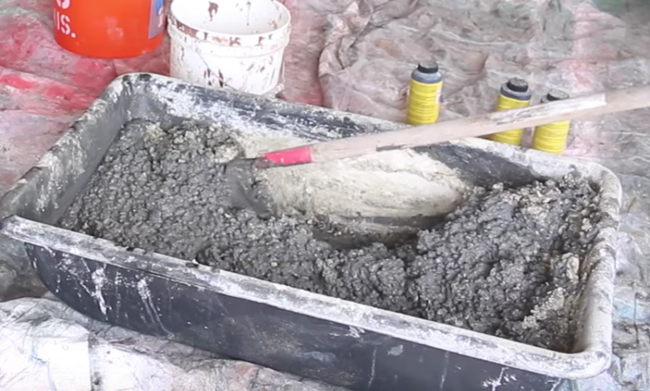 Mix another batch of concrete and pour that into the form so the form is filled to the top. Continue to tap the sides and underside with a hammer to remove any air bubbles. Next, go across the form using a long board going back in for in a sawing motion to level the concrete. Once that is done the concrete will need to set for at least 48 hours. Begin assembling the base. 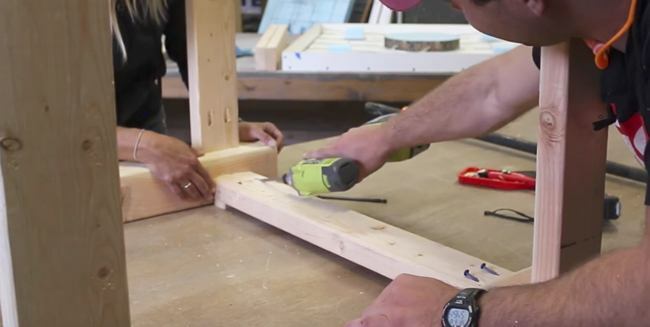 Use a mitre saw to cut the legs and cross supports. 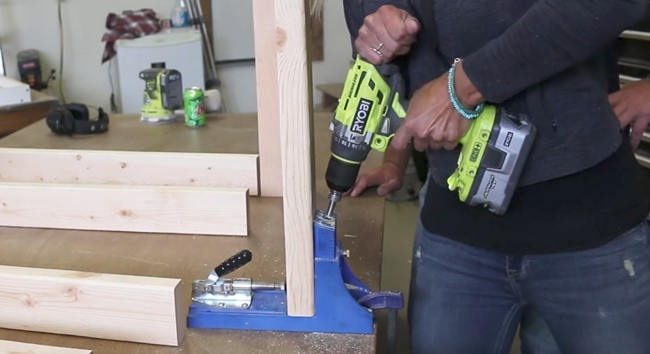 Using a Kreg jig , drill pocket holes into the inside face of all of the cross supports on both ends. 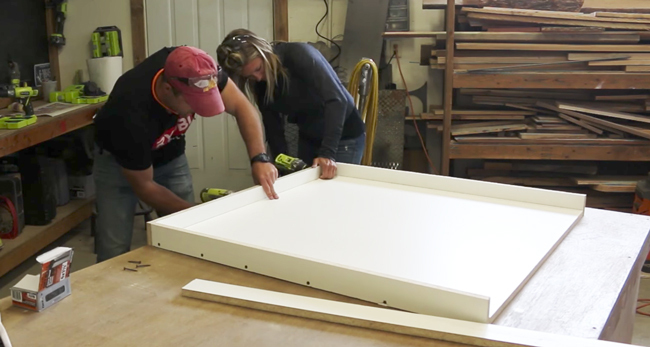 Use the pocket holes to assemble the table, starting with the legs and the top supports laid out on a flat surface so they are all square. Secure them together with screws through the pocket holes making sure that all boards are square and pulled together with the screws. Then use a similar process to attach the second set of supports making sure to measure from the bottom of every leg so they are level. Once the table is assembled put on at least 2 coats of finish. We use a deck sealer from Thompson's Waterseal. Once the concrete has set for a couple of days, remove the screws from the melamine form and carefully take off the side boards. After you remove the tabletop from the form, check for any pockets that could be large enough that you need fill them. If there are no large pockets, you can begin sanding. 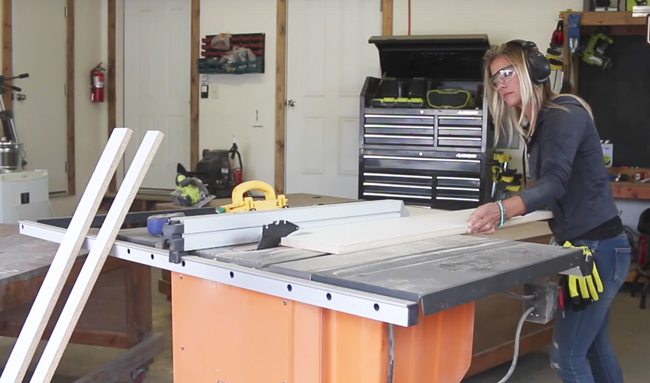 Take your time sanding the tabletop, making sure to sand both top and bottom as well as any corner of edge surface that anyone may touch. You can use 120 or 220 grit sandpaper to do the sanding being. If there are any large pockets from air bubbles us the Portland cement slurry mixture to fill voids in concrete. To mix this you simply use water (or acrylic fortifier) and Portland cement. Make this mixture and fill in any spots that you may see. Let this dry and cure before sanding it down again. Once you are happy with the top, use water and a cloth to wash any dust off of the surface of the concrete before applying the sealer. Next, apply 4 to 6 even smooth coats of your sealer. Once the table has finished setting and the sealer has dried you can lay your tabletop onto the wooden base. To finish off the table you can run LED lights underneath the tabletop making sure that they shine through the coasters and through the cooler. 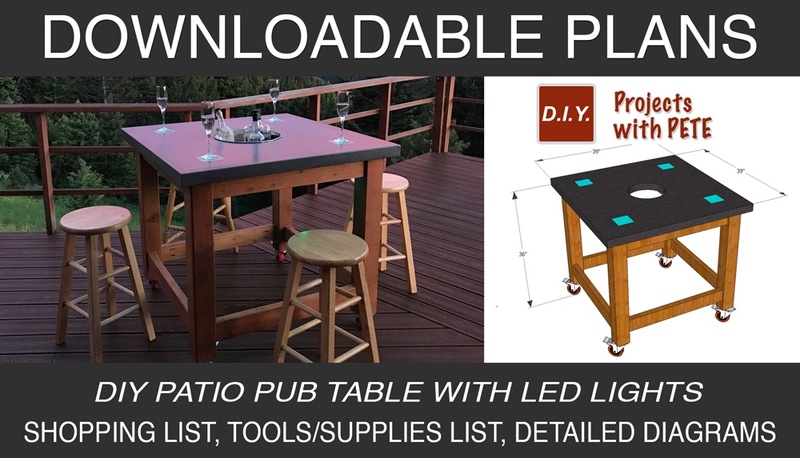 Thanks so much for checking out the Concrete Pub Table post and I’d love to hear how your project goes! Please post photos on Facebook at www.facebook.com/diyprojectswithpete and subscribe to my Youtube channel at www.youtube.com/diyprojectswithpete.